This is what Simon boldly proclaims in the film’s opening minutes. Except he’s not. He’s…gay! Also, Simon is a white man, has the perfect relationship with his family (Jennifer Garner and Josh Duhamel [DILF]), perfect relationship with his sister, lives in a giant house, goes to a giant high school, has an incredible relationship with all of his friends, and has a MacBook. He is not like us, but he is the Hollywood cipher of us, which subconsciously guilts us into thinking that we’re not enough. (sigh) This is too violent a reaction for a movie that I genuinely enjoyed. This movie is vanilla ice cream with crunchy chocolate bits sprinkled on top. It’s delicious, it looks great, but ultimately it’s a very familiar flavor with just the slightest, tiniest bit of crunch. 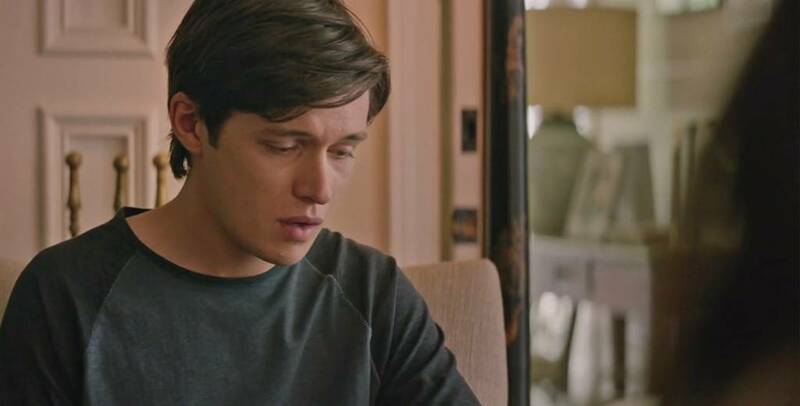 Nick Robinson is the most inoffensive teenager ever to anchor a movie, which is why he’s perfectly bland to get Love, Simon to play in middle America. He fails to exude any semblance of movie-star charisma, yet still surpasses wet-blanket status; he is a perfect 2.5 out of 5 stars, which makes him safe for our collective moms to watch and get invested in. The movie manages to match its star’s neutral tone fairly well; it seems less interested in the burgeoning feelings of its subject and more on high school drama. A surprisingly large amount of this movie is preoccupied with a blackmailing threat. To prevent the school from finding out that he’s gay, he must manipulate his friends to fall in love with each other. It’s convoluted, but does result in some lovely pieces that are ultimately less interesting than the central conceit. When Simon finally does come out, the movie is still more invested in the high school drama versus the emotional consequences. There’s a tiny fight here, a small revelation there, but it seems so sanitized. Which may be more realistic, but seems dissonant compared to the amount of emotional build-up the movie gives it. Simon’s coming-out could be the worst thing in the world, but the ultimate consequences fail to provide catharsis disproving his fears; nor is there really an anti-catharsis that proves his fears were correct. It’s somewhere in the middle, which does not match with the message of the movie and fits in with the general theme of vanilla. I enjoyed 98% of this movie. Simon doesn’t couple with anyone until 4 minutes before the movie, making queerness just another path in romance and not something to be cinematically explored, especially in juxtaposition to the movie’s repeated assertion that it takes place in TEMPLATE CITY USA. It’s an interesting statement in how not much of a statement it is. But also, it is a statement? But the movie really falls apart in its ending sequence. Thanks to a subplot involving a Post Secret-type blog and a secret romantic pen pal, Simon’s romantic persuasion becomes performative for the public at large. And I very purposefully choose to not use sexuality because the movie doesn’t even broach it; Love, Simon is far more invested in queer romance and not queer relationships. This culminates in a proclamation that Simon will be meeting his romantic pen pal underneath the Ferris wheel. And this is the climax of the movie where the entire school gathers. His friends cheer him on. He’s going to finally get a boyfriend! Which makes his queerness…a public show? For others? The movie treats it like Simon’s happy ending, but prior to this moment, he screams at his blackmailer about how his coming-out-of-the-closet was his own issue. Yet the movie has a smug (shudder)liberal self-satisfaction(/shudder). “It’s great that Simon is gay! Him being gay is special! Let’s go celebrate him being gay!” It would be the like everyone at school turned into my supportive mom. If I were Simon, I would find a hat and pull it over my entire body in embarrassment, then live in the hat until I died there. It’s a weird sequence which echoes the 3rd act of Get Out writ…smaller, actually. It’s not writ large. Plus, everyone else in the movie is coded as heterosexual unless otherwise stated (Ethan, the flamboyantly out kid), so it’s not like his public action is a mobilizing tool used for empowerment of others struggling with non-heterosexual feelings. For a movie that is so casually progressive, it’s also strangely conservative. Which…is…how you win over the states in the breadbasket? Love, Simon is wholly inoffensive, which is truly a milestone for queer cinema. This is a widely released movie which has not been met with picket signs. The movie’s protagonist is not a stereotype, but the definition of white bread. Its complete lack of personality makes this a watershed moment, the point where these kinds of stories can be told in the mainstream without any reaction. Which…y’know, alright. I saw the 5:10 PM show of Love, Simon at Regal Westgate on April 3, 2018.